Please present tour voucher to ground operator upon arrival to reconfirm your tour day and to confirm tour departure time and other details. You will have an opportunity to select a preferred tour date at time of booking; however , tours pre-purchased online are not pre-reserved for a specific date. Child rates, where applicable, will display at time of booking and vary according to age. 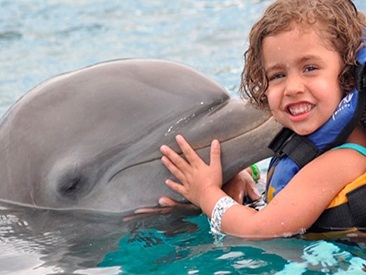 At Dolphin Discovery at Punta Cana, you and your children can enjoy safe and fun activities that are especially designed for you. You can enjoy the dolphins evens if swimming isn't your thing because there is a platform every one stands on while the dolphins aproach. There, the friendly dolphins give you a handshake, a kiss, and a hug. Dolphins are known for their playful nature, something that is really displayed by them at Dolphin Discovery Punta Cana. Come and have the experience of a lifetime. Behaviors: peck shake, kiss, hand target, free time. Dolphin interaction time: 40 minutes. Departure Time/Location: Hotel lobby; time varies by hotel. Included: Round trip transportation by land, guidance and interaction with dolphin (40 min), life jacket and accessibility to lockers, dressing room, bathrooms and showers. Not Included: Transportation for companions (those not participating in dolphin encounter), towels, photos, meals and beverages. For those that would like to travel with participants as an observer only (no Dolphin Encounter inlcuded), choose the "Dolphin Discovery - Encounter (Observer Only)" option that is offered to include just the transportation to accompany participants. Recommendations/Notes: Wear comfortable clothes, sandals, swimsuit, sunglasses and hat. Bring towel and extra money for meals, beverages, souvenirs or additional expenses. Wearing jewelry and accessories that can damage the dolphins' skin is prohibited as is the use of sunscreen or any chemical that affects their site (lotions, perfumes, etc). Maximum 15 participants per group. Children under 12 years old must participate with a paying adult and will perform activities according to their strength level. Pregnant women who are up to 5 months into their pregnancy can participate in the Encounter program. The use of a life jacket is mandatory for all interactive programs. This option is available for those accompanying friends or family who are participating in the Dolphin Encounter, but who do not wish to participate themselves. Recommendations/Notes: Wear comfortable clothes, sandals, sunglasses and hat. Bring extra money for meals, beverages, souvenirs or additional expenses. This option is available for those accompanying friends or family who are participating in the Dolphin Encounter, but who do not wish to participate themselves. Companions can not participate in aquatic activities or take pictures. 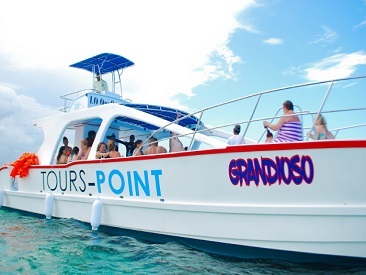 Power Cruiser is a splendid ride aboard a luxury catamaran, with all the comfort, where you can enjoy the beautiful scenery of white sand beaches and turquoise waters of Bavaro. On the way, as well as relax and sunbathe on deck, you'll learn about the amazing diversity of marine life in this region with a fascinating snorkeling adventure. Goldfish, different types of corals, crustaceans and with any luck, even sea turtles are part of this amazing ecosystem. And to make this unforgettable experience, enjoy a fun party on board with open bar, music, the best entertainment and incomparable atmosphere, culminating with a dip in a natural pool. Recommendations/Notes: Wear comfortable clothes, sandals, swimsuit, sunglasses and hat. Bring towel, biodegradable sunscreen, extra money for souvenirs or other expenses. Not recommended for those with health problems or during pregnancy. Recommended for ages 6+. Dolphin Royal Swim in Punta Cana. Pure excitement: action and speed! Interact with the dolphins as they kiss you, snuggle with you and do aerial acrobatics for you. 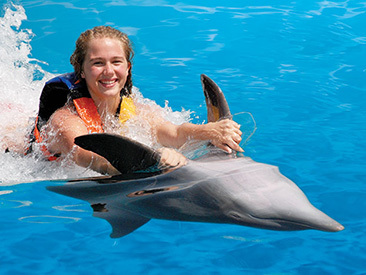 The Royal Swim With Dolphins Program is a dynamic activity, the perfect combination of action and nature. What makes the Royal Swim different than other Swim With Dolphin Programs is the famous foot push, where two dolphins lift you out of the water. Includes the famous Foot-Push trick, with which you will cross the water propelled by the strength of your new friends. Fin shake, lovely kisses, and free time with your new friends. Recommendations/Notes: Wear comfortable clothes, sandals, swimsuit, sunglasses and hat. Bring towel and extra money for meals, beverages, souvenirs or additional expenses. Wearing jewelry and other accessories that can damage the dolphins' skin is prohibited, as is the use of sunscreen or any chemical (lotions, perfumes, etc) that affects their sight. Maximum 15 people per group. Restrictions apply for children. Not suitable for pregnant women. The use of a life jacket is mandatory for all interactive programs. Children under 12 years old must swim with a paying adult and will perform activities according to their strength level. 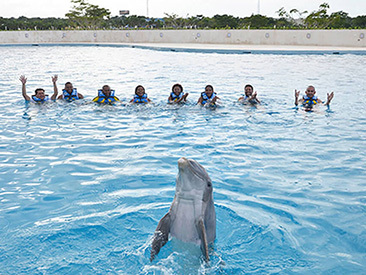 Enjoy this Dolphin Swim Adventure interactive program in Punta Cana. Take a closer look at one of these loveable marine mammals as it comes close for a kiss and hug, and performs aerial acrobatics. Take an exhilarating boogie push, where the dolphin will push you across the surface of the water, while you ride a boogie board. Awesome! Get ready for the fun belly ride, where you will hold on to the dolphin's fins as it rides backwards across the water. Watch the dolphin’s neat tricks; they really are such charismatic creatures! A professional trainer will share plenty of information about these incredible marine friends and ensure that you make the most of this experience, during your vacation to the Dominican Republic. Recommendations/Notes: Wear comfortable clothes, sandals, swimsuit, sunglasses and hat. Bring a towel and extra money for meals, beverages, photos, souvenirs or additional expenses. Wearing jewelry and accessories that can damage the dolphins' skin is prohibited, as is the use of sunscreen or any chemical (lotions, perfumes, etc) that affects their sight. Maximum 15 participants per group. Pregnant women cannot participate in this activity. The use of a life jacket is mandatory for all interactive programs. Children under 12 years old must swim with a paying adult and will perform activities according to their strength level. Experience an extraordinary day with this tour of deep sea fishing off the coast of Bavaro and Punta Cana. 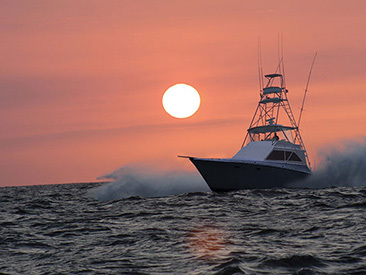 The combination of the waters from the Atlantic Ocean and the Caribbean Sea create the perfect conditions for sport fishing--immense schools of fish are attracted to the area. You can participate as a fisherman and enjoy this exhilarating tour. Recommendations/Notes: Wear sunscreen and comfortable clothes. Take motion sickness pills before getting on board. No fishing license is required. Minimum age to participate is 8 years. Complimentary snacks are included for private groups only, not included for open groups. Start the day with a panoramic ride to the pier, where you will embark on a fantastic semi-submarine to admire the beauty of the ocean floor from a dry and comfortable place. Then it's time to jump into the water with a snorkel to see this incredible ecosystem from up-close! On the second boat, you will set sail on the beautiful Caribbean Sea and stop at an impressive natural pool, famous for the abundance of starfish living there. 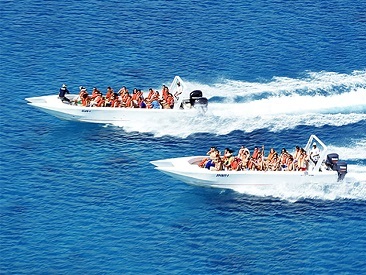 Then, get ready for the best activity of the day: a visit to Saona Island by speedboat! Treat yourself to a delicious buffet lunch under the shade of palm trees on the beach before exploring everything the island has to offer. What's next it's up to you: you can swim, play volleyball, learn to dance merengue or just relax! End this fantastic day with a relaxing trip on an impressive catamaran. The guides will be with you during the whole day. This is without a doubt the recipe for the best day of your holidays! Included: Transportation, catamaran, semi-submarine, speedboat cruise, drinks, guide, lunch, drinks on the beach (non-alcoholic), leisure time on Saona Island. Recommendations/Notes: Wear comfortable clothing, a swimsuit, sunglasses and shoes that can get wet. Bring biodegradable suncreen, a camera and money for personal expenses. The sailing to and back from the island may be by speedboat or catamaran. Not recommended for those with back problems or pregnant women. A vegetarian lunch option is available and must be requested at time of booking. Take the chance to discover the Dominican Republic while enjoying its most spectacular highlights in a day full of luxury! Cruise along the dazzling coast in a fantastic catamaran and refresh at a beautiful natural pool. Enjoy a snorkel adventure and discover the natural wonders of the Caribbena sea. Have fun with the company of fish and the incredible marine life of the area. Taste an exquisite and delicious meal at a marvelous beach club. Have some cocktails and relax at the breathtaking Juanillo Beach. Definitely a day that you'll never forget! Included: Snorkel excursion, catamaran ride, domestic bar, transportation. Recommendations/Notes: Wear swimsuit, comfortable clothing and shoes. Bring sunglasses, hat, biodegradable sunscreen and extra money for additional expeses. The use of life jackets for any aquatic activity is mandatory. People under the influence of drugs are not allowed to participate. No alcoholic drinks are served before the snorkel activity (white wine and red wine are only included during lunch). This excursion is not recommended for people with heart problems, respiratory diseases, mobility restrictions or those who have had recent surgery. The journey begins at the Muelle de Caño Hondo, where a speedboat will take you across the majestic forest called Mangrove Swamps, part of the National Park Los Haitises. Caves, keys, mogotes, sanctuary of endemic birds, three ecosystems and marshes, make this ecological paradise the perfect place to become one with nature, take in all the beauty of the surroundings and of course to take lots of pictures. This ecological park contains large amounts of underground bodies of water, 100 to 150 rivers that cross each other, forming a mixture of fresh and salty water where crabs, oysters, carps, river shrimp, and even the manatee, or marine elephant, call it home. Its luxuriant vegetation is everywhere you turn, even surrounding the different caves formerly used by the Pirates of the Caribbean to hide their treasures. After this unforgettable journey, you will go towards the Paraiso Caño Hondo. In this earthly paradise you will enjoy an exquisite Dominican buffet-style lunch, but you will also be able to enjoy a terrific day and bathe as much as you would want in its natural waterfalls. Tour Inclusions: Land transportation (buses with A/C); guide; sea transportation (boats); open bar (rum, water, sodas); lunch buffet. Not Included: Video/photos, tips, souvenirs. Recommendations/Notes: Bring insect repellent, swimsuit, towel, sunscreen, sunglasses, your camera and cash for souvenirs or extras. Your day starts with a scenic drive to the dock where you will board your boat to set sail and begin your adventure. The first stop will be for a cocktail at the amazing Natural Pool lagoon, famous for its abundance of starfish. Continue to the main highlight of the day, Saona Island, by speedboat for a barbeque lunch served buffet-style under the shade of palm trees right on the superb beach. What's next is up to you; swimming, volleyball, learn how to dance merengue or sit back and relax! For your return, you will board an impressive catamaran for a memorable sailing voyage complete with unlimited drinks.Your personal guides will be with you through the day and will be there to look after you and to make sure you have everything you need. This is undoubtedly the recipe for the best day of your vacation! Tour Inclusions: Transportation from Juan Dolio hotels, catamaran cruise, speed boat cruise, lunch, drinks (alcoholic & non-alcoholic), professional guide. A vegetarian lunch option is available (must be requested at time of booking). Recommendations/Notes: The sailing to and from the island may be speedboat/catamaran or catamaran/speedboat (the order may change). Not recommended for pregnant women or for children under 2 (due to speed boat cruise). We recommend you wear comfortable clothing, swimsuit, sunglasses and sandals or shoes that can get wet. Wear biodegradable sunscreen and bring your camera to capture some great shots. A vegetarian lunch option is available and must be requested at time of booking. An unforgettable journey awaits you in this Santo Domingo Half Day tour. Get to know more about the history and culture of the Dominican Republic by visiting some of the area's significant buildings and their surroundings.This pleasant tour over charming cobblestoned streets, amid beautifully restored buildings, is waiting to amaze you; ochre-colored stone facades displaying three shields: the Imperial one of Carlos V; the one second for the Spanish Island and the third for the City of Santo Domingo. Or the house built by Columbus, Las Casas Reales (Museum of the Royal Houses), including the Presidential Palace, relics of the island’s colonial era, among many other equally interesting constructions. Discover the atmosphere of Calle de Las Damas, the oldest street not only in the Dominican Republic, but within the continent at large in the New World, and where the largest number of monuments in the surrounding area are best preserved. In other words, get ready for a time-travel to bygone eras by enlivening your knowledge of history, in style. Not Included: Tips, photos, souvenirs. Notes: For some stops on the tour (Cathedral & National Monument), shoulders & knees must be covered by clothing, so please dress accordingly. We recommend you wear comfortable clothes, sunscreen, sun glasses, sandals or tennis shoes. Dont forget to bring your camera and extra money for personal expenses. Santo Domingo is the oldest city of the Americas, don’t miss your chance and discover the true history of the Dominican Republic. This tour begins with the spectacular caves of "Los Tres Ojos" (three eyes caves), then leads you to the colonial area of the capital to visit the house built by Columbus. You'll see some sensational sights from the Christopher Columbus lighthouse to the hisorical cathedral. Soak up the atmosphere in the oldest street of the new world "Calle la Damas" and experience a tyical Dominican market where the bargains are endless and the bartering is fun!! Be a culture vulture and discover the capital city of this beautiful island. Tour Inclusions: Transportation, lunch and beverages, tour guide, entrance to all visited sites. Not Included: Tips, photos and souvenirs. Recommendations/Notes: For some stops on the tour, shoulders & knees must be covered by clothing, so please dress accordingly. We recommend you wear comfortable clothes, swimsuit, sunscreen, sunglasses, sandals or tennis shoes and a cap or hat. Bring your camera and extra money. Don't miss the chance to explore incredible arid and dry landscapes from the air. The Cumayasa Canopy tour takes you on a thrilling 1 mile journey of smooth zip lines! 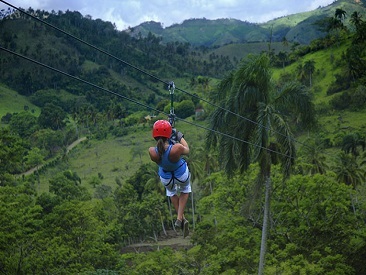 Get ready to fly over the beautiful dry forests of the Dominican Republic on the Cumayasa Conopy tour! This fantastic place has created an ideal location and offers a one mile ride of smooth stainless double steel cables through the air, with all the safety you need. The double secure lines are composed of 7 different cables and 14 platforms. This adventure ends at the edge of the Cumayasa River, which is the perfect place for you to relax, enjoy the view and spend a wonderful time in this magical forest. Tour Inclusions: Transportation, guide, bottled water, canopy tour, hanging bridges. Not Included: Video, photos, tips. Recommendations/Notes: Wear comfortable clothes, sunscreen, hat or cap and bring extra money for additional expenses. Photographic cameras as not allowed during the canopy activity. Minimum age to participate in the canopy activity is 5 years old due to safety restrictions. Maximum weight: 260 lbs. Visit the charming artists' village of Altos De Chavon, then enjoy great snorkelling near beautiful Catalina Island where you can spend the day participating in fun activities! Visit the luxurious and most complete resort in the caribbean, Casa de Campo, then board a Mississippi boat towards the magnificent Chavon river, scene of the movie Apocalypse Now. You will then board the catamaran and sail in the direction of Catalina Island, the jewel of the Caribbean. Anchor will be dropped in one of the major snorkeling sites in the Dominican Republic, where you'll be equipped with masks and snorkels and will be able to view its most beautiful colors. The next stop is the island of Catalina, with its white sands and crystal-clear waters. Recommendations/Notes: Wear beach clothing, swimsuit, sandals, sunglasses and cap or hat. Bring towel, camera, biodegradable sunscreen and extra money for souvenirs, tips or additional expenses. Head through the scenic countryside to Anumaya where your thrilling zipline adventure begins! Be prepared for the thrill of a lifetime as you soar through the trees, platform to platform on what was the first zipline course in the Dominican Republic. Expert advice is given by trained professionals then it's away you go - Tarzan eat your heart out! Recommendations/Notes: Wear comfortable clothing and shoes that fasten securely. Use biodegradable sunscreen and insect repellent. Bring a camera and extra money. This activity is not recommended for guests with severe back problems, physical or motor disabilities or pregnant women. Participants must weigh between 60 pounds and 275 pounds and fit into the safety harness (max 48” waist and 26” each thigh). Children ages 4 and up may participate as long as they meet the minimum requirements for this excursion. It is recommended that those with long hair tie it back for this activity. 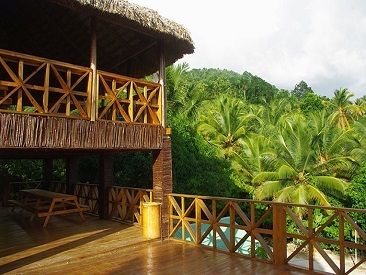 Explore all the highlights that the beautiful island of Samana has to offer. Take a walk on the wild side and discover the real Dominican Republic with this complete tour around white sandy beaches, waterfalls, amazing views and the beauty of a true Caribbean paradise. Enjoy a bus ride through the countryside till you reach Bahia de Miches, where the real adventure begins when you board an amazing catamaran. Sail across the bay and enjoy the panoramic views of the coast. Hop on a safari truck that will take you for a delightful sight-seeing tour of Samana. Take a ride into the wild until you reach the amazing Zumbador waterfall, here you can jump into the water and be amazed by the majesty of the view: a treat for all your senses. For your relaxation, enjoy a tasty Caribbean lunch at a local restaurant while you gaze on the magnificent views of the surroundings. 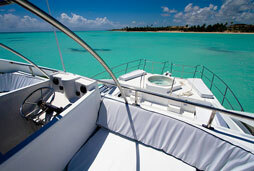 Climb aboard the catamaran and take a breathtaking ride to Cayo Levantado Island. Experience white sandy beaches and the warm turquoise water of this romantic Paradise, while you take a last glimpse of the amazing Samana Bay. 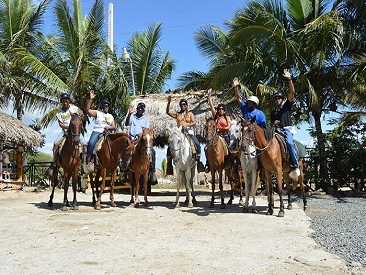 Included: Transportation; sampling of coffee, hot chocolate, fruits, honey; helmet; boots; refreshments; access to National Park El Limon and waterfalls; all inclusive lunch at el Timon restaurant (beer, wine and local cocktails); drinks in Cayo Levantado; official guides. Not Included: Photos and videos, souvenirs, tips. Recommendations/Notes: Wear comfortable clothing, closed-toed shoes, swimsuit, bug repellent and sunglasses. Bring towel, sunscreen, camera and extra money. This activity is not recommended for pregnant women and is not suitable for people who have difficulty walking. Combine the best adventures! With this special package you can enjoy the beautiful landscapes of Punta Cana, with an exciting circuit of zip lines; immerse yourself in the cool waters of the famous Blue Hole; or visit the heart of the land, as you enter into the magnificent tunnels of Iguabonita Cave. 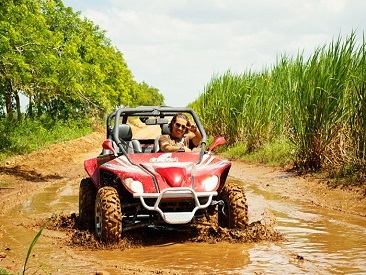 Choose the activities that will make your vacation in Punta Cana an unforgettable experience! Tour Inclusions: Transportation, bottled water, lunch, beverages, 3 activities (zip line tour, Blue hole swim tour, cave expedition or cenote excursion). Not Included: Alcoholic beverages, souvenirs, tips. Notes/Recommendations: Wear comfortable clothing and sneakers. If you have long hair, please tie it back. Bring swimsuit, towel, biodegradable insect repellent and extra money for souvenirs or additional expenses. Some health restrictions apply. Cameras, cell phones or other loose objects are not allowed in the tour. Some health restrictions apply for safety reasons. 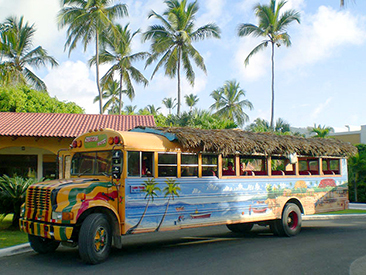 Discover the country side of the Dominican Republic aboard the Chercha Bus, a bus painted and decorated in the purest Dominican style. 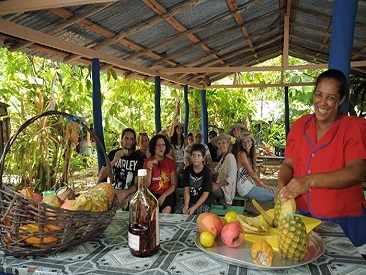 This tour will help you discover the true culture of the island through the customs and traditions of the local people. 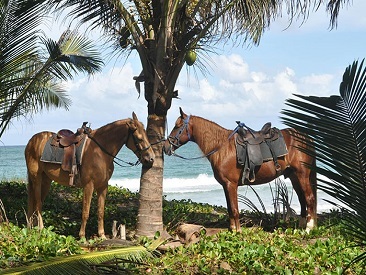 Plus, you'll enjoy an incredible horseback ride while admiring the beauty of the landscape, flora and fauna. You will have the opportunity to take amazing photographs! Finally, you'll relax in Uvero Alto beach swimming in its crystal clear waters and enjoying a lunch that includes meat, fish or pasta. Everything you need for an unforgettable day on your vacation. Recommendations/Notes: Please wear closed-toed shoes and long pants if you want to go horseback riding. Don't forget your camera and extra money. The Super Jeep Expedition tour starts with a ride along the Punta Cana coast road to Miches in the north east of the island. The first stop is in a sugar cane plantation where you can see how the majority of Haitian community makes a living! After touring varied rural areas of the countryside, you’ll enjoy incredible horseback riding in the great surroundings of this island. Don't worry if you've never ridden before, the course is designed for beginners, children and all experience levels. 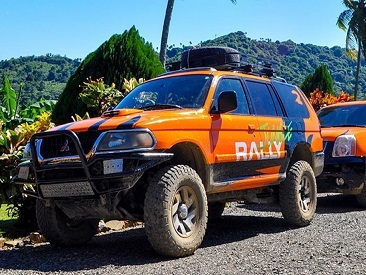 You’ll continue your drive towards Anamuya village, before taking part in a 1 mile off road track, where you can demonstrate your off road skills, on the way to the Atabeyra Ranch where you will relax and enjoy a delicious Caribbean style restaurant buffet. Walk in the backyard garden where you can see cocoa and coffee plantations and learn about the ancient way to prepare organic coffee with a free tasting. Then get ready for the Zip Lines Ranch! 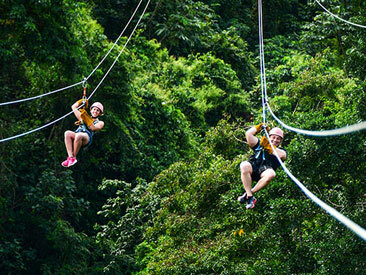 This fun filled experience boast unrivaled panoramic views of the jungle. You’ll experience smile-inducing speeds as you travel along a series of 4 Zip Lines suspended high above great tropical vegetation. Last but not least, you’ll reach the beautiful Macao Beach with its crystalline water for a refreshing swim, before heading back to the base. Recommendations/Notes: Wear comfortable clothes, closed-toed shoes, biodegradable sunscreen, hat or cap. Bring insect repellent, swimsuit, a towel and extra cash for additional expenses. 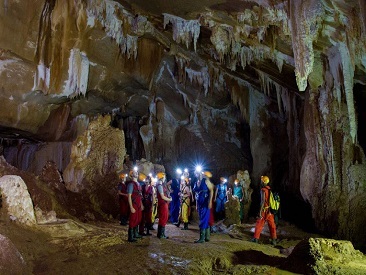 The minimum age to participate in this excursion is 5 years. Paricipants under 16 years of age must be accompanied by a paying adult. Participants wishing to drive the vehicle must be 18 years or older and must present a valid drivers license. Drivers are not permitted to consume alcohol. Four guests per Jeep. To get a private Jeep for 1 or 2 people, you must pay for 3. Witness the beauty of the Dominican Republic like you never imagined! Get ready to enjoy the fun activities La Hacienda has to offer. The horseback riding is the best way to appreciate the breathtaking beauty of this place, where you will traverse through forests and streams, with spectacular views. 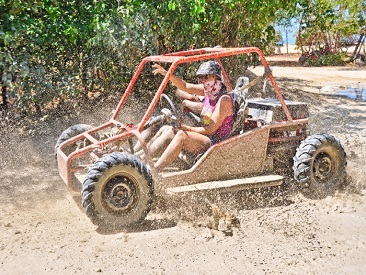 Also, you'll have the chance to feel the rush aboard fully-equipped buggies as you bounce along dirt tracks.You'll make a stop in a stream to refresh yourself in its waters, before flying over valleys and mountains in incredible zip lines. And if that's not enough at the end of your circuit, if you wish, you will have the opportunity to go down through the Quick Jump, a leap from more than 20 meters! Embrace the true essence of the island on the safari tour, You'll take a look at coffee, cacao and sugar cane plantations. Visit a Dominican town where you'll get to know the lifestyle of the local people, enjoying their typical products. Plus, take a ride on a chairlift, from the base to the top of the mountain with incredible views of the jungle and the Caribbean Sea. Included: Transportation, buffet, access to all activities of the park, safety equipment, tastings of typical products from the area. Recommendations/Notes: Bring swimsuit, sunblock, a towel, sunglasses, a change of clothes and extra cash for additional expenses. The minimum age for driving a buggy is 18 years old, a drivers license is required. The minimum age to participate in the activities is 8 years old. Pregnant women can only participate on the Safari tour. Persons with a height less than 4 feet or weighing more than 250 pounds can not participate in the zip line or horseback riding. Explore the landscape on horseback, suitable for beginners and experienced riders alike. An ideal opportunity to see the countryside or beaches of this beautiful area on the back of your gentle four legged friends. If you are an experienced rider, let the guides know as galloping may be an option for you. Big or small, they can provide horses to suit all. Included: Transportation, horse, tour guide. Recommendations/Notes: Wear comfortable clothing, swimsuit, hiking shoes, sunscreen and insect repellant. Bring a camera and extra cash for additional expenses. This activity is not recommended for individuals with significant health problems. Participants must be at least 6 years old. For hotels in Cap Cana, this tour is only offered on Thursdays. Dare to dive into the crystal clear turquoise waters of the Caribbean Sea and discover the breathtaking diversity of its marine life! Ideal for the whole family, the Power Dive tour gives you the opportunity to feel comfortable breathing underwater without the need for long and expensive workouts, heavy equipment, or dive certifications. Because of its simple breathing system with a long probe, you can explore the underwater world, accompanied by expert instructors, who will guide you among many banks of colorful fish, corals and crustaceans. And if you wish to continue discovering the wonders of this fascinating ecosystem, you will be able to take a fun adventure of snorkel, or sail on calm waters aboard a catamaran cruise, with the best atmosphere and drinks included. Recommendations/Notes: Wear comfortable clothes, sandals, a hat, biodegradable sunscreen, swimsuit and sunglasses. Bring a towel, a camera and extra money for additional expenses. This activity is not recommended for people with health problems or during pregnancy. Learn about the culture and history of this wonderful country while enjoying the most beautiful regions of the Dominican Republic. Country Express offers everything that the full day tour offers except lunch/horses…and price! It's is a great option for those staying only a shorter time, young families or anyone who don’t want to spend a full day away from their resort. You will visit a typical country house and taste the typical specialties at a local café and see a cacao plantation where the sun rarely shines through. Take the chance to mingle with the locals with your next stop at an elementary school. Visit the Butterfly Garden, an amazing butterfly farm. See the impressive sugar cane and vegetable plantations, showing all of the local bananas, mangos, yucca pineapple and finish at the beautiful macao beach. Not Included: Tips, souvenirs, personal expenses. Recommendations/Notes: Wear comfortable clothing and footwear, sunscreen, sunglasses and a hat. Bring camera and extra cash for additional expenses and souvenirs. This activity is not recommended for guests with severe back problems, motor or physical handicaps, children under two years old or pregnant women. 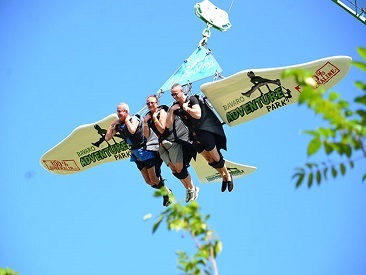 Get ready to have the time of your life with your entire family and friends at Bavaro Adventure Park VIP! This is a 42 acres amusement park in Punta Cana with nature trails and 15 different attractions for you to enjoy as many times as you want! Enjoy incredible adventures and feel the adrenaline while flying through the zip lines, have a laugh rolling within the Zorb bubbles or feel the intensity of playing paintball. If you need rest and relaxation you may visit the Dino World or use the flight simulator and feel like a true pilot. You'll have fun like never before! Included: Round-trip transportation, water at every station and unlimited use of 15 different attractions..
Recommendations/Notes: Closed-toe shoes are required for this activity. Wear comfortable clothing, sunscreen and sunglasses. Bring a camera and extra money for additional expenses. Some of the attractions are limited to a maximum weight of 260 pounds. Age of admission for children varies in different attractions. Restrictions apply to pregnant women. Certain activities are not recommended for people with heart or physical conditions; fear of heights; prone to dizziness or panic attacks. Not Included: Tour video, photos, souvenirs, coffee, cacao, cigars and other local produces; at the "after tour bar," sodas, sports drinks, beer and rum will be available for purchase. Notes: Wear comfortable clothes, sunglasses, swimsuit, sunscreen and comfortable footwear (sports shoes are recommended). Bring a camera and extra money for additional expenses. Drivers must be at least 18 years old. Passengers must be at least 5 years old. Pregnant women and guests under the influence of alcohol cannot participate in this tour. Guests with mobility restrictions will not be able to visit the cave. Not recommended for persons with severe back problems. This option is for two riders in the buggy. From hotels located in Cap Cana, this tour is only offered on Thursdays. Notes: Wear comfortable clothes, sunglasses, swimsuit, sunscreen and comfortable footwear (sports shoes are recommended). Bring a camera and extra money for additional expenses. Drivers must be at least 18 years old. Pregnant women and guests under the influence of alcohol cannot participate in this tour. Guests with mobility restrictions will not be able to visit the cave. Not recommended for persons with severe back problems. This option is for a single rider in the buggy. From hotels located in Cap Cana, this tour is only offered on Thursdays. Enjoy enigmatic creatures that extinct over 65 million years ago in the fantastic Bavaro Adventure Park Jurassic World. Learn about their lives, alimentation and what could have led to their extinction. The park has more than 40 full-scale dinosaurs, immersed in the virgin countryside. A wide display comprising the famous Tyrannosaurus Rex, the most terrible hunter of all time; The Iguanodon, the giant Diplodocus, the Stegosaurus and many others. All of the dinosaurs are animatronic, they move and emit sound! Without a doubt, this is an educational and exciting experience at the same time, for the whole family to enjoy. Recommendations/Notes: Closed-toe shoes are required for this activity. Wear comfortable clothing, sunscreen and sunglasses. Bring a camera and extra money for additional expenses. Ever felt like treating yourself and your family to a once in a lifetime experience? 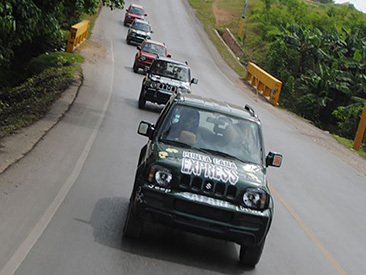 Here is your chance to buckle up to receive personalized VIP treatment with the Jungle Rally off road adventure. 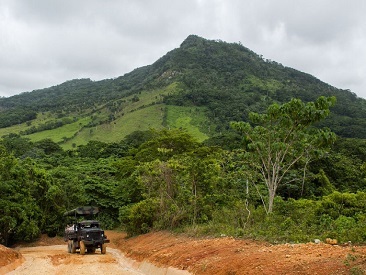 They’ll drive you out into the countryside, in air-conditioned 4x4 Rally Trucks fitted with special off road suspension and provided with a fully stocked bar. Your day will start with a typical Dominican Passion Fruit Mimosa at the famous Macao beach. Continue on to meet the kids at one of the various schools that Outback Adventures sponsors so you get to see how you give back to the local communities just by being on the tour. In this unique tour, you’ll be invited into a country home owned by a family that has been in the area for centuries. Once you’ve had a glimpse of Dominican country living, you’ll get to walk through their coffee and cacao plantations and even get a chance to buy the organic goods that are produced on-site. Your lunch, which comes with a side-dish of spectacular views, will definitely be a huge highlight, all served at a mountain ranch you’ll never forget. 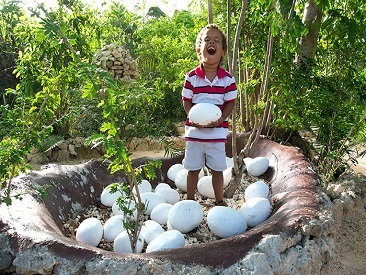 Your day ends at a beautiful riverside ranch where you’ll have the chance to learn all about coconuts. End your day either swaying in a hammock with a Coco Loco in your hand or end taking a dip in the refreshing river oasis on-site. Recommended: Wear sunscreen, insect repellent, swimsuit and comfortable clothing and shoes (flip flops are ok). Bring a camera and extra money for additional expenses. Due to the nature of this activity, pregnant women and those with back problems are not permitted on this excursion. Marinarium invites you to discover the wonders of the reef and its marine life. Enjoy an exciting family fun catamaran cruise along the stunning white Bavaro coastline. Top up your tan as you cruise gently along the Bavaro beaches or learn how to snorkel at a fantastic reef. 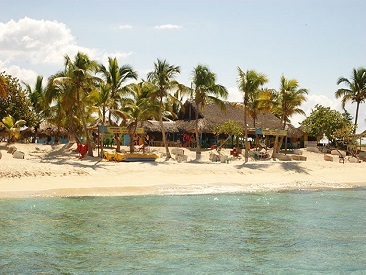 Enjoy a delicious lunch on the catamaran as you anchor by a virgin beach; one of the few remaining in the area. Indulge in a tropical cocktail and cool off with a refreshing dip in the shallow waters of Bavaro's own natural pool. This will be a great day for all the family that you will not forget! Recommendations/Notes: Wear beach clothing, sandals, swimsuit, sunglasses and hat. Bring towel, camera, biodegradable sunscreen and cash for additional expenses, souvenirs and tips. Go where the tour buses can’t as you enter the depths of the island to explore the unspoiled Dominican countryside. Sit back and enjoy the breathtaking landscape as you travel off the beaten track. Visit small colorful villages and see how the local people live. Included: Round-trip transportation, lunch and drinks, tour guide. Not Included: Souvenirs, personal expenses, tips. Be prepared to get down and get dirty! VIP Polaris Buggy, self drive four wheel fun! An action packed afternoon, driving in follow the leader style through dusty dirt roads to an incredible beach, banana plantations and lush countryside. Not Included: Tour video, photos, souvenirs, coffee, cacao, cigars and other local produces; at the “after-tour bar:” soft drinks, sports beverages, beer and rum will be available for purchase. Recommendations/Notes: Wear sunglasses, swimsuit, sunscreen and comfortable footwear (sports shoes are recommended). Bring a camera and extra money for additional expenses. Drivers must be 18 years old. Passengers accompanied by an adult must be at least 5 years old. Pregnant women and guests under the influence of alcohol cannot participate in this tour. Guests with mobility difficulties or disabled guests will not be able to visit the cave. 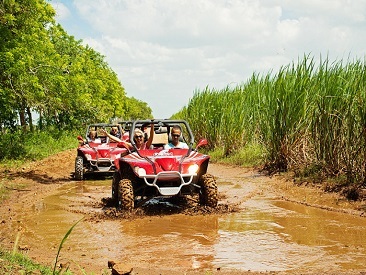 The most authentic and exciting way to discover Punta Cana. 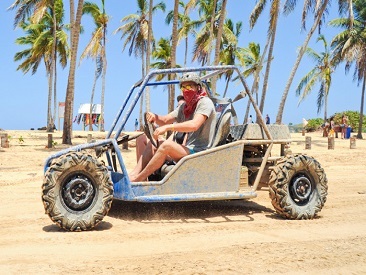 Discover Punta Cana aboard one of our fun and modern buggies. Visit a ranch, a spectacular and unspoiled beach, the most beautiful ecological reserve in the Caribbean and immerse yourself in this luscious Vegetation. Refressh in the crystal –clear water of the lagoons. Road trails and much more! Recommendations/Notes: Wear comfortable clothes, swimsuit, closed-toe shoes, sunglasses and sunscreen. Bring a camera and extra cash for souvenirs. Diving in the lagoons is prohibited. Drivers must be 16 years old, and co-pilot must be at least 6 years old. SEATREK....A unique experience available only at SEAQUARIUM! They'll pick you up at your hotel in their fun bus to take you to the Jetty. After a simple and short briefing on the beach you will board a catamaran which will take you to the platform where you will be fitted out with one of their exclusive SEATREK diving helmets enabling you to descend a stairway and enjoy a walk under the sea, among tropical fish and corals that lead to submerged submarine. Afterwards you can snorkel among stingrays and sharks. 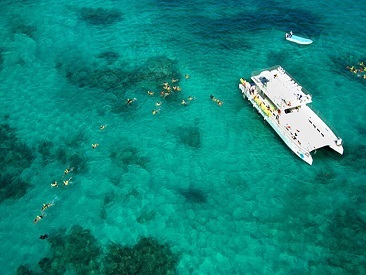 Before returning, you will enjoy a party on the catamaran and swim at the natural pool. On the beach you will be welcomed by Wally, an affectionate sea lion, who will give you a loud kiss! Recommendations/Notes: Wear beach clothing, swimsuit, sandals, sunglasses and hat. Bring biodegradable sunscreen, towel, camera and cash for souvenirs, meals, tips or additional expenses. Participants must know how to swim. Jewelry and accessories are advised against. Pregnant women cannot participate in this activity. Passengers traveling with companion tickets do not participate in undersea walk. The minimum height requirement for the underwater walk is 48"/120cm. Tour days available for visitors from Uvero Alto are Monday, Wednesday and Friday (subject to change). Discover the mystic and breathtaking Cenote Las Ondas. This adventure includes a calm and relaxing eco walk through a trail located in the surroundings of a tropical dry forest in the grounds of the ancient Taino Chiefdom of Higuey. Throughout this incredible tour you will be accompanied by a knowledgeable guide that will provide you with information regarding the fauna, flora, the cenote and its formation and all about the Taino, African and Dominican cultures. On the eco walk towards Las Ondas you will be able to see vivid representations and depictions of the Tainos, their rituals and the objects used in their daily living. Upon reaching the mouth of the cave, you will go in via a staircase and as soon as you enter you will be in awe by the majesty and beauty of the crystal clear waters of this underground cenote. 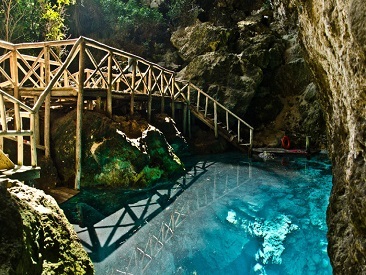 Not only will you be able to see incredible cave formations and original Taino Pictograms, but you will also have the unique opportunity to go in and enjoy a swim in these invigorating waters, previously used by the ancient Tainos to make magical and spiritual rituals. Not Included: Food and drinks, tips, souvenirs. Recommended/Notes: Wear comfortable clothing, swimsuit and sunscreen. Long hair should be pulled back. Bring a towel and extra money for additional expenses. Cameras, cell phones and other loose objects are not allowed on the tour. Minimum age 6 years. Discover Hoyo Azul, a hidden cenote located at the foot of a 75 m high cliff with the most astonishingly turquoise waters nature can offer. Also you will have the chance to gaze at exotic orchids and other rare and unique plants. The Hoyo Azul ecological tour is designed to educate and bring our visitors face to face with nature of the Dominican Republic. 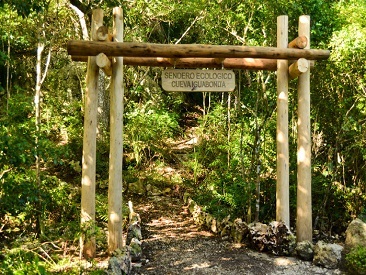 You will be accompanied by an experienced guide that will show you the way through amazing eco trails where you will have the opportunity to gaze at orchids, bromeliads, ferns and cactus, stopping briefly at each station and learning everything about these fascinating species of plants. The tour will end up at Hoyo Azul cave; a natural pool, with crystal clear blue water, formed at the base of a giant cliff. Visitors will be able to jump in and swim in its incredible blue crystal clear water for 30 minutes. Recommendations/Notes: Wear comfortable clothing, swimsuit, closed-toed shoes and sunscreen. Cameras, cell phones and other loose objects are not allowed on the tour. The fascinating Iguabonita Cave Expedition begins with a walk along the slopes of El Farallon cliff. Upon reaching the top, you'll visit the unexplored paths between lush jungle to discover some of its greatest natural resources: medicinal plants, herbs and barks, which even today are used by healers on the island. After a 25 minute walk, you will reach the mouth of the cave, where the underground adventure begins! Discover the vast network of tunnels and chambers supported by expert guides who will explain about the geological processes that, over thousands of years, gave rise to these impressive rock formations. To exit the cave, you only need to climb an ecological ladder. On the way back, you will reach the starting point, where you can rest, relax and share all the details of this unforgettable experience in the heart of Cap Cana. Recommendations/Notes: Wear comfortable clothing and sneakers. Long hair should be pulled back. Bring swimsuit, towel, biodegradable sunscreen and bug repellant and extra money for souvenirs, beverages and additional expenses. Participants must be in good physical condition to complete the uphill walk. Cameras, cell phones and other loose objects are not allowed on the tour. This tour is not recommended for pregnant women or travelers with heart disease, high blood pressure, breathing problems, dizziness, asthma, epilepsy, Parkinson’s or physical disabilities. People under the influence of alcohol, strong medicines or other substances are not allowed to participate. 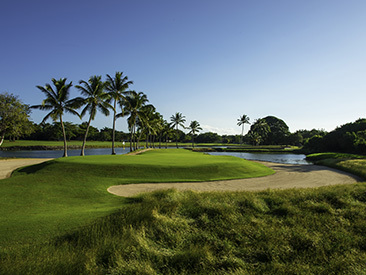 The Iberostar Bavaro Golf Course is a magnificent 18-hole course created by world renowned designer P. B. Dye. It boasts a length of 6,897 yards, a rating of 73, and a 126 slope. The 105 white-silica sand bunkers dotted throughout the undulated course form an eye-catching contrast with the intensely green supreme paspalum grass, perfect for this tropical region. Situated just 25km from Punta Cana airport, Iberostate Bávaro Golf Course encompasses lakes, streams, and even some desert-like features, providing a great golfing experience for every player, from amateur to pro. Includes Green Fee, driving range prior to play, lockers and showers, shared golf cart, tees and beverage cart service while playing. Prime Time from 7am-1pm (times subject to change by season). Not Included: Transportation, golf club rental, golf balls, fee for rider (someone not playing golf, but riding along in the cart--requires prior reservation), caddy. These items are payable directly at the pro shop on arrival. Transportation can be arranged with your Sunwing Experiences representative on arrival. Dress Code: Golf attire and soft spikes. Golf lessons available at an additional cost (reservations must be made prior to arrival). Tee times can be arranged prior to arrival. Contact information will be provided on your invoice/travel documents after the golf option is reserved. Non-transferrable. Tee times can be rescheduled only if tee times are available. Cancellations & No Shows: Cancellations made 48 hours before apply 100% refund. Cancelations made between 36-48 hours before apply 80% refund. Cancelations made between 24-36 hours before apply 50% refund. Cancellations made less than 24 hours no refund. No show no refund. Must be purchased at least 72 hours prior to arrival. 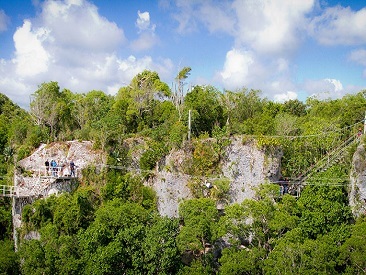 You will begin by putting on your safety harnesses under the strict supervision of your professional guides, and once that has been done, you will walk over a hanging bridge to then receive the general information of the tour, and more importantly the safety procedures. Start the Adventure hiking up to the first tower and zip line to the other side of the hill with the incredible cable length of 2.296 feet. Climbing up to the top of the hill the Adrenaline is growing as soon as you are ready for the free fall jump from the Extreme Tower, up to 100 feet high. Your adventure will continue with the fastest two cables, with an incredible speed of 40 Miles per hour. 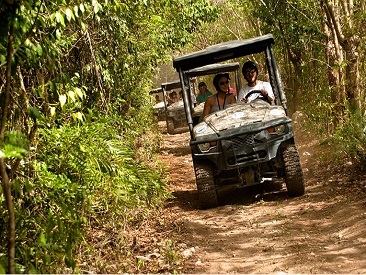 Several connection trails through the lush vegetation of the jungle will add to your experience in the Dominican Forest. After you experience the excitement, the amazing environment, you can relax at the base where fresh fruit, coffee and water are available. Recommended: Wear comfortable clothing and closed-toed shoes. Bring biodegradable sunscreen and bug repellant. Participants’ weights must fall between 60 lbs and 275 lbs. Harness measurements are maximum 48” in the waist and 26” in each leg. This tour is not recommended for people with back problems, mobility restrictions, children under 6 years old or pregnant women. It's recommended that those with long hair tie it back for this activity. This fascinating adventure includes 8 zip lines, the highest being 75 m above the ground and the longest 450 m. Enjoy a journey on a suspension bridge and 4 ecological trails. Experience a unique zip line where the main element is a cliff known as “El Farallon” from where all the lines are attached. Farallon Cliff is a stunning natural rock formation with a singular majesty. This tour is a one-of-a-kind because it operates in a exclusive forest area located in Cap Cana, home to unique species of flora and fauna. Recommendations/Notes: Wear comfortable clothing and sneakers. Bring swimsuit, towel, biodegradable sunscreen and insect repellent and extra money. If you have long hair, it is recommended that you tie it back. Cameras, cell phones or other loose objects are not allowed on the tour. This activity is not recommended for guests with severe back problems, physical or motor disabilities, children under 6 years of age or pregnant women. The maximum weight for men is 270 pounds; maximum weight for women is 240 pounds. Harness will fit up to 42” waist. Only 6 kids per turn. Learn about the Dominican culture while driving a Jeep, and get to know the real life outside your hotel! Find out about local traditions and see plantations where local produce is grown, on this enjoyable Jeep Safari. You´ll get to see some plantations of different produce such as cacao, coffee, banana, mango, avocado, ginger, chestnut, papaya, pineapple, and banana, among various other fruits, as well as citrus and herbs. Also, enjoy a rich natural organic cocoa toast; coffee, a tropical fruit snack, and a drink of Mamajuana before visiting the beautiful beach of Macao. On arrival at Rio Rancho Monte you will have the option of riding on a canopy. Taste a refreshing welcome drink, and enjoy a rich Dominican lunch that includes rice with vegetables, spaghetti, Dominican yucca fries, fried potatoes, bread, cooked Creole eggplant, green salad, pork, grilled chicken and fruit. Recommendations/Notes: Wear comfortable clothing, sunglasses and sunscreen. Don't forget to bring a camera and extra money. This excursion is not recommended for pregnant women. Minimum age to drive the vehicle is 18 years old with valid drivers license. Jeeps hold up to 4 people. Coco Bongo Show & Disco is the place for a great night out during your vacation in Punta Cana! Enjoy an eclectic mixture of music, dance, trapeze artists, acrobats and scenes from famous movies played out to mainstream dance music. The night really is a performance, and you are there to be entertained and amazed. No wonder Coco Bongo Show & Disco has been praised by international media. With the domestic open bar freely flowing you can enjoy this party atmosphere and get on the dance floor to dance the night away. Enjoy privileged view of the show from a VIP table. Recommendations/Notes: Photos with professional cameras are not allowed. Don't forget to bring money for tips, souvenirs or additional expenses. Participants must be 18+. Departure from hotels approximately 10pm - 10:30pm. End: 3:30am. Return to hotel approximately 4am - 4:30am (subject to change). 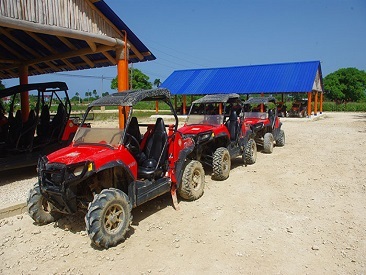 Live an unforgettable adventure on the rural roads of Bayahibe behind the wheel of your own "Cobra" buggy; the most fun off-road vehicle in the Dominican Republic! Start this incredible ride with expert guides giving you a brief talk about safety measures and tips to be applied during the tour. Once you're buckled up, you'll be ready to ride your buggy and drive by exotic trails, remote landscapes and rivers that display the natural beauty of this wonderful region. Then, drive over a path along back roads, and by cane plantations, on your way towards El Gato town. Freshen up at Chavon River, and swim in its cool waters, slide on three fantastic zip lines and navigate the crystal clear waters aboard a kayak. End this splendid day with a final buggy ride to make your way back to base while you say goodbye to this fabulous adventure. Tour Inclusions: Guide service, helmet (mandatory), bottled water. Not Included: Tour video & photos, souvenirs, coffee, cacao, cigars and other local products, and the following beverages at the "after tour bar:" sodas, sports, beverages, beer & rum. Recommendations/Notes: Wear a swimsuit, comfortable clothing and shoes (no flip flops), sunglasses, hat or cap (preferably with straps). Bring towel, biodogradable sunscreen, camera and cash for souvenirs, tips, beverages or additional expenses. Drivers must be at least 18 years old and have a valid driver's license. Not recommended for people in wheelchairs or those who have difficulties walking. Pregnant women and guests under the influence of alcohol are not allowed on the tour. If you or your kids ever dreamed of meeting dolphins to interact with, then this Dolphin Encounter is the beginning of an amazing friendship for you all! Enjoy an unforgettable day in the paradise of Punta Cana, and let yourselves be surprised by the grace and intelligence with which these enchanting and friendly sea creatures welcome you. At the beginning of this incredible adventure, your new friends will greet you by waving their fins and giving you a loving kiss. Afterwards, without the need to swim or float, as this activity takes place on a platform in shallow water, an adorable dolphin will approach so you can caress its tummy, embrace in a hug and spend some time together to frolic around. See how they show off their gracious and impossible moves! Not Included: Transportation for companions, towels, photos, meals and beverages, souvenirs. Recommendations/Notes: Wear comfortable clothes, sandals, swimsuit, sunglasses and a hat. Bring a towel and extra money for meals, beverages, photos, souvenirs or additional expenses. Wearing jewelry and accessories that can damage the dolphin's skin is prohibited, as is the use of sunscreen or any chemical (lotions, perfumes, etc.) that may affect their sight. Maximum 15 participants per group. Children under 12 years old must swim with a paying adult and will perform activities according to their strength level. Pregnant women cannot participate. The use of a life jacket is mandatory for all interactive programs. Sail along the shoreline and indulge in the most modern spa program in Punta Cana. Prepare yourself for an absolute moment of luxury, forget everything and place yourself in the care of Dr. Fish ocean spa for a truly unforgettable day! First, a pedicure treatment is in order where the therapists are the little Dr. Fish called Garra Rufa. These fish will gently exfoliate your feet by removing the dead cells for smooth skin. Therapists on board will apply a special foot treatment aimed at eliminating toxins. Choose from a large variety of spa treatments. Also, join in on a bio-Pilates class while cruising along the coast of Bavaro Punta Cana for 3 hours. The seating capacity is kept to a minimum to allow for personal attention. Enjoy natural juices and fresh fruits to keep your energy levels up as well as natural herbal infusions, plus an energy- balanced meal at their ocean restaurant, with roasted chicken, couscous and tropical salad, all topped with a nice chilled glass of white wine to make the experience complete! Recommendations/Notes: Adults Only (18+). Wear beach clothing, swimsuit, sunglasses and cap or hat. Bring towel, biodegradable sunscreen, camera, and extra money for souvenirs, tips or additional expenses. 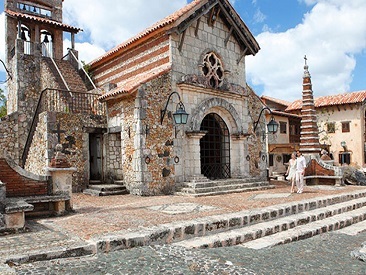 Visit the village of Altos de Chavon, a medieval town perfectly recreated the way it was in Italy in the XVI century. Afterward, get on board a Mississippi-style riverboat and sail through the magnificent Chavon River, scene of the famous movie Apocalypse Now. Also enjoy a catamaran cruise heading for Catalina Island, a true Caribbean gem! Once there, the anchor will be dropped in one of the best snorkel sites in the Dominican Republic; equipped with masks and snorkel, discover the natural wonders hidden in the depths, such as corals and countless colorful fish. After a relaxing sunbath on its white sand beaches and after so much activity you will surely have worked up an appetite; why not delight with a delicious buffet which includes white or red wine? To round things up, sail back on a relaxing catamaran cruise, as nothing comes close to top off this Catalina VIP tour before calling it a day. The best snorkeling cruise in Punta Cana. 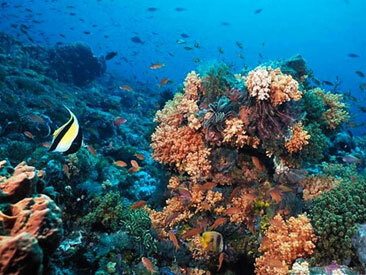 Discover the wonders of the reef and the marine life. Join us for a fantastic half day cruise where you will have the unique opportunity to snorkel with stingrays and nurse sharks. You'll take a beautiful sightseeing catamaran cruise along the shores of Cabeza de Toro and Bavaro. Finally, you will reach paradise, where you will relax in the waters of Bavaro's waist deep natural pool with your favourite cocktail in hand! Recommendations: Wear beach clothing, sandals, swimsuit, sunglasses and hat or cap. Bring towel, camera, biodegradable sunscreen and cash for additional expenses, souvenirs and tips. Not recommended for pregnant women or children under 2 years old. Discover the beautiful Dominican landscapes, diverse plantations, towns and local people in one day! 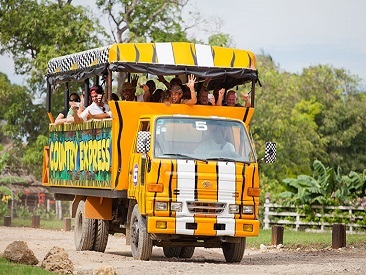 You'll take the road aboard a fun truck vehicle, to discover this wonderful earthly paradise and witness the beauty of the landscape surrounding the imposing Socoa Waterfall (almost 100 feet high), where you'll have the opportunity to enjoy a refreshing swim. Enter the deep forest near the Los Haitises National Park, where you'll be in full contact with nature. Here you'll observe the stunning scenery, exotic plants of the region, and coffee and cocoa plantations. You'll also pay visit to a local family, where you'll learn and may participate in the process of roasting and grinding coffee, and enjoy an aromatic cup of hot coffee local style! And finally you'll hike through the orchards and cacao trees. Included: Transportation, tour guide, bottled water, entrance monuments. Not Included: Photos, souvenirs, alcoholic drinks, lunch. Recommendations/Notes: Wear comfortable clothes, walking shoes, biodegradable sunscreen. Bring swimsuit, a towel and extra cash for additional expenses. Not recommended for pregnant women or those with mobility restrictions. 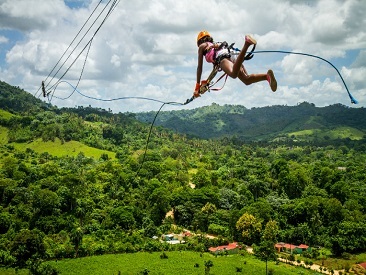 Soar high on the Dominican Republic’s original Zip-Line Tour, surrounded by amazing landscapes such as the beautiful Anamuya mountain range and lush green countryside. An expert canopy guide will tell all you need to know about the route and the equipment. After the safety briefing and a demonstration, you will be ready for the first platform. 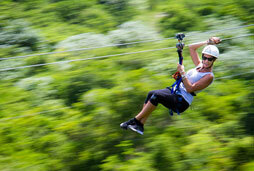 The Zip Line Adventures tour entails 12 lines over 18 platforms over lush tropical vegetation. You need about an hour to complete it. If it’s your first time, don’t worry, the first cables aren’t too long or too fast, so will you have the chance to build your confidence! Once you get into the swing of things, slide on the only side-by-side cable in the country at 2,624 feet long! It's a thrilling experience, and during the activity, you may reach speeds of up to 35 miles per hour! To quench your thirst, you'll enjoy juicy fresh fruits and non-alcoholic drinks as you relax after this wonderful adventure. Included: Equipment, instructor, 12 cable circuit, water and soft drinks, fruit, transportation. Not Included: Photos, souvenirs, tips. Recommendations/Notes: Wear comfortable clothing, tennis shoes or closed toed shoes. Bring sunscreen, insect repellent, camera, bottle of water, extra money for tips and souvenirs. Pregnant women or those that suffer from heart conditions/disability and/or mobility problems cannot take part in this tour. Minimum age to participate is 6 years old (children between 6-12 years might be accompanied by guides on the longest cables). Due to the safety equipment, maximum waist size is 44" and maximum weight is 250 lbs. The core of this outing is snorkeling, snorkeling, and snorkeling--an activity through which you can really get in touch with nature and truly enjoy the beauty of the sea itself; something no one should miss in an outing like this. The stunning marine life seen in detail, contrasted with the incredible corals as backdrop, guarantees an incredible exploration haven for anyone getting below the surface. Explore at your leisure the beautiful corals; see mollusks, multicolored fish, varied marine life; pay attention to the seabed too, since small, living creatures will be shyly crawling away as you go by, or rather be staring at you from behind algae hideouts with curiosity! Once on the island, take a stroll to explore the beach and surrounding environs, swim in the warm Caribbean waters to cool off or simply bask on the white powdery sands to let the world go by. This exercise will make you hungry but not to fret since there will be delicious, and complete, buffet-style lunch! Included: Food, drinks, transportation, guide and snorkel equipment. Not Included: Souvenirs, video, tips. Recommendations/Notes: Wear swimwear, sandals. Bring sunscreen, a towel, camera and extra money for souvenirs. An historic adventure awaits you when you explore the oldest city in the Americas and first capital of the New World. If you love history, culture and natural wonders, this outing is tailor-made for you, for it’ll take you on a full day of strolling, touring, visiting and admiring the sights interspersed within the city limits. Follow the footsteps of the original European explorers on a day-trip filled with history which uncovers many unknown facts that only a trip like this can reveal. 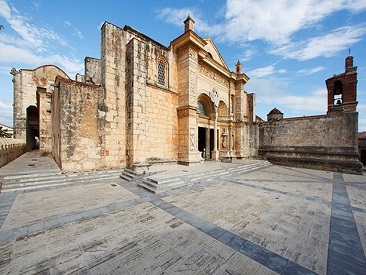 Visit Santo Domingo's main sites within the colonial zone such as Colon's Old House or Las Casas Reales, formerly used as the Parliament's facilities. See historic sites like the first Catholic cathedral in the continent and the Columbus lighthouse. Walk on the continent's oldest cobblestoned street "Calle de las Damas", and many other interesting locations of modern Santo Domingo. Not Included: Souvenirs, tips and photos. Recommendations/Notes: Wear comfortable clothing, sunscreen, sunglasses and comfortable walking shoes, sandals or sneakers. Bring a camera and cash for additional expenses. Shoulders and knees must be covered for some visits (Cathedral and National Monument); dress accordingly. Talcum white beaches, coconut palms, crystal clear turquoise waters and the special Dominican touch that makes for an unforgettable day of smiles - rum and merengue! Your first stop will be for a cocktail at the amazing Natural Pool lagoon, famous for its abundance of starfish. Continue to Saona Island by speedboat for a barbeque lunch served buffet-style under the shade of palm trees right on the superb beach. What's next is up to you: swimming, volleyball, merengue or relaxing on the beach! For your return, you will board an impressive catamaran for a memorable sailing voyage complete with unlimited drinks. This is undoubtedly the recipe for the best day of your vacation! Recommendations/Notes: Wear comfortable clothing, swimsuit, sunglasses and sandals or shoes that can bet wet, biodegradable sunscreen. Bring a camera and cash for additional expenses. This tour is not suitable for pregnant women due to the speedboat ride. A vegetarian lunch option is available and must be requested at time of booking. The sailing to and from the island may be speedboat/catamaran or catamaran/speedboat. An unforgettable experience with dolphins! 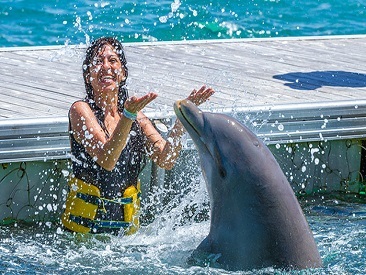 They will welcome you by waving their fins or with a kiss that will steal your heart.The Dolphin Royal Swim tour is one of the most complete and fun programs. You'll learn about the behavior, habits, and preferences of these beautiful marine mammals. You'll feel their impressive strength and speed as they push you through the water, with the exciting Foot-Push trick. This is an experience you will remember for a lifetime. Handshakes, hugs and kisses, are some of the other activities you will share with these wonderful marine creatures. Plus, you'll have the chance to spend time to share an unparalleled bond with your new best friends. Included: Round trip transportation by land, guidance and interactive swim with a dolphin, life jacket, acess to lockers, dressing room, bathrooms and shower. Not Included: Transportation for companions (those not participating in the Dolphin Royal Swim), towels, photos, meals, beverages, souvenirs, tips. Recommendations/Notes: Wear comfortable clothes, sandals, swimsuit, sunglasses and hat. Bring a towel and extra money for meals, beverages, souvenirs or additional expenses. Wearing jewelry or accessories that can damage the dolphins' skin is prohibited, as is the use of sunscreen or any chemical (lotions, perfumes, etc) that may affect their eyes. Maximum 15 participants per group. Children under age 12 must swim with a paying adult and will perform activities according to their strength level. Pregnant women cannot participate in this activity. The use of a life jacket is mandatory for all interactive programs. 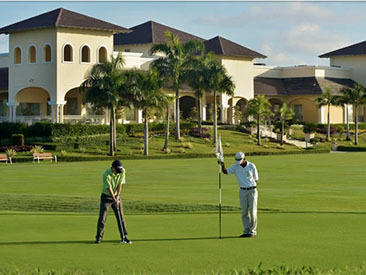 The Iberostar Bavaro Golf Club is an inland course located in the Iberostar Resort complex. Designer P.B. Dye has transformed a naturally flat landscape into a challenging course of elevated terrain with swales and mounding, 105 of his signature sand bunkers, lakes and extensive use of rock work. The lush landscaping features many trees and palms, and includes roughs with native grasses. Includes greens fees, golf cart, drinks & snacks and transportation to the Golf camp for guests at the Iberostar Bavaro, Iberostar Dominicana and Iberostar Grand Bavaro. Dress code in effect. Club rentals available at an additional cost. Cancellations & No Shows: 24hrs prior to tee time - no refund for no shows or late cancelations. 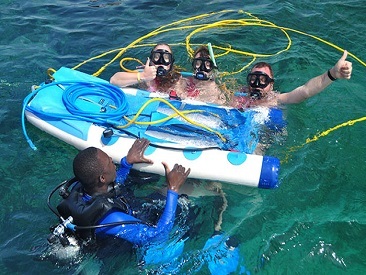 Snuba (a combination of snorkeling and scuba) allows for experiencing scuba diving with the ease of snorkeling, but without the need of scuba diving certification courses and/or the need of specialized equipment. Snuba lets you walk the seabed without the need for oxygen tanks or having to resurface for air since a hose is attached to your spacesuit-like outfit, allowing for a truly relaxed way of moving around on the seabed.The bilingual staff will be on hand to assist you at all times and make sure you have a pleasant and safe experience. 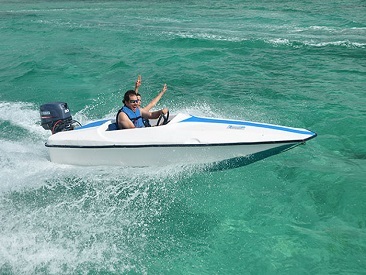 Included, there’s an adrenaline fix by eventually driving a speed boat over the crystalline waters of Bavaro for you to appreciate in greater detail the beauty of the surroundings. Also, brace for an interesting and exciting snorkeling session that’ll take to explore the astounding coral reef, teeming with swirling schools of multicolored fish. There will be water and soft drinks to quench your thirst along the way. Recommendations/Notes: Wear beach clothing, swimsuit, sunglasses and a hat. Bring biodegradable sunscreen, towel, waterproof camera and cash for souvenirs, tips or additional expenses. Minimum age to drive the boat is 18. Children from 8 years allowed as companion on double boat. Tour price may vary depending on the number of passengers (single or double). For those of you that love snorkeling, this will be like your own personal paradise amongst the tropical fish! Relax on a sunbed or be energetic with a ride on a banana boat with fishing and snorkeling all included for you. Your day starts with a visit to Altos de Chavon and a tour around the cobblestone walkways and magnificent views. Next it's on to La Romana where your cruise boat awaits to sail past the millionaires houses and yachts at Casa del Campo before your arrival at the island of Catalina. There is a stunning beach area where you will enjoy a delicious lobster BBQ Buffet lunch and take your pick from the activities on offer. A great alternative for those of you that have been to Saona before. Included: Round-trip transportation, BBQ Buffet lunch, boat transport to Catalina Island, snorkeling gear, domestic drinks and snacks, tour guide. Recommendations/Notes: Wear comfortable clothing, swimsuit, sunglasses and sunscreen. Bring a camera and extra money for additional expenses. Experience this adventure through the best that nature has to offer; over and under the ground! Set in Los Haitises National Park, Cueva Fun Fun (formerly knows as the Devil's Cave) is thought to be the largest cavern in the Caribbean. Your expert guides will be with you every step of the way as you explore this amazing natural phenomena. Enjoy a tropical style breakfast upon arrival at the ranch then get kitted out for the day. A horseback ride and trek through the forest gives you the opportunity to learn about the local plants and wildlife as you make your way to the entrance of the cave. Rappel, climb, swim and hike your way through the magical underground caverns and be impressed by the geological formations including stalagmites, stalagtites, lava columns and more. Learn the stories and rituals behind the cave art and petroglyphs (engraved rocks); remnants from pre-Columbian times. After making your way back to the ranch, you will be ready for the delicious Dominican style lunch; a well deserved reward after an energetic and unforgettable day! Recommendations/Notes: Wear closed-toe shoes, swimsuit for river swim, sunscreen, towel and a camera. The minimum age to participate in this activity is 11 years old. Due to the physical nature of this activity, it is not suitable for pregnant women, children under 11 years old and individuals with mobility issues. Coco Bongo Show & Disco is a must see it is a cross between Cirque du Soleil/Theatre/Nightclub. Everything from dance teams to trapeze artists, gymnasts and scenes from famous movies is played out to mainstream dance music. The night really is a performance, not like any other place, and you are there to be entertained and amazed. No wonder Coco Bongo Show & Disco has been praised by international media. 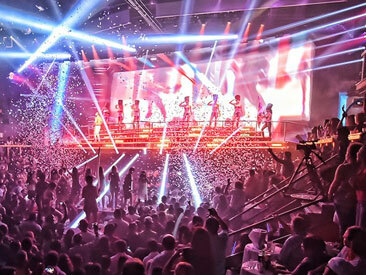 Coco Bongo Show & Disco will create a unique experience that You´ll remember forever. That´s why year after year, customers come back to be part of the best night of their lives. Recommendations/Notes: Photos with professional cameras are not allowed. Don't forget to bring money for tips, souvenirs or additional expenses. Participants must be 18+. Departure from hotels approximately 10pm - 10:30pm. Return to hotel approximately 4am - 4:30am (subject to change). Recommendations/Notes: Photos with professional cameras are not allowed. Don't forget to bring money for tips, souvenirs or additional expenses. Participants must be 18+. Departure from hotel is approximately 10pm - 10:50pm. Return to hotel is approximately 4am - 4:30am (subject to change). Float your stress away with the ultimate spa cruise experience. Sail along the coast and indulge in the most modern spa program in Punta Cana. Sail along with Dr. Fish and experience the most complete and modern spa program of Punta Cana. Come and join us on the most trendy spa experience in the area. Choose from a large variety of spa treatments while cruising along the coast of Punta Cana. Prepare yourself for an absolute moment of luxury, forget everything and place yourself in the care of Dr Fish ocean spa for a truly unforgettable day! Enjoy the natural wonders of Punta Cana in your own way! This package is a unique opportunity to make the most of your stay. Choose to fly on an amazing natural cliff with an exciting zip line or refresh yourself in the waters of the magnificent Blue Hole which, surrounded by lush vegetation is undoubtedly a true paradise on earth. But if you are looking for a bit more adventure, explore the paths of the jungle in the impressive Iguabonita Cave. There, right in the heart of the land, you will discover the geological processes that made possible this fascinating network of tunnels; one of the best kept treasures of this region. How you want to make your Punta Cana vacation an unforgettable experience, is up to you! Recommendations/Notes: Wear comfortable clothing and sneakers. Long hair should be pulled back. Bring swimsuit, towel, biodegradable sunscreen and insect repellent and extra money for souvenirs and additional expenses. Cameras, cell phones and other loose objects are not allowed on the tour. Some health-related restrictions apply. Zip Line Restrictions: Maximum weight restrictions apply. 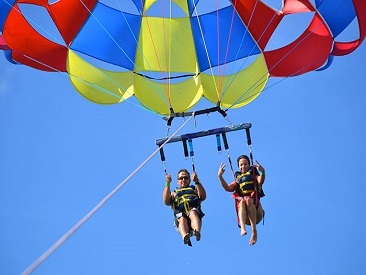 Power Fly is a fascinating experience, where you can enjoy the majestic landscapes of Punta Cana, through the three of the most popular aquatic activities of this beach destination! Contemplate the different shades of blue of the Caribbean from the above, with an exciting parasailing tour. Then, discover the breathtaking diversity of its marine life, by immersing yourself in its crystal clear waters with a snorkel adventure. 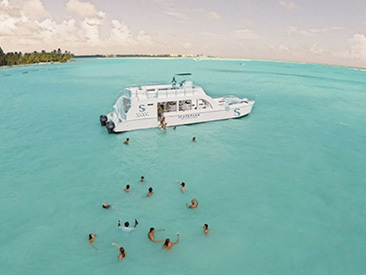 Finally, relax aboard a catamaran, where you can lie on deck to get the perfect tan and enjoy the unforgettable panoramic views of the white sand coasts of Punta Cana. Also, you may join the great party atmosphere with your favorite drink. 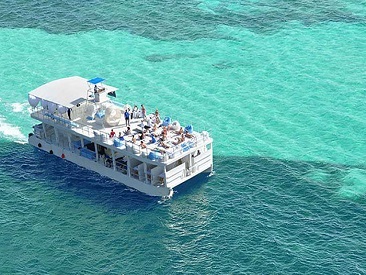 Take Happy Hour to the next level on a catamaran! This is the perfect excursion for celebrating an anniversary, a honeymoon, a birthday or any other special occasion. Start by sailing to a colorful coral reef and snorkeling with hundreds of tropical fish. Later, get toasty with some Mamajuana rum and start dancing to merengue and bachata on the way to a natural pool. Participants will be surrounded by palm trees on the only undeveloped beach around. 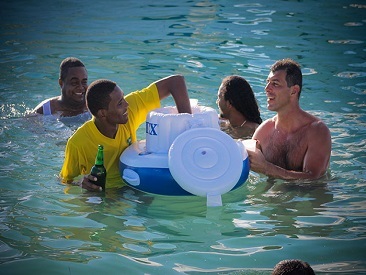 Guests will also get to take advantage of the floating bar on the beach, making it the perfect environment to escape from any stress or worries from everyday life. Paradise has never been so close as it is on a smooth sail to a largely untouched natural beach, so come join the party on your Punta Cana vacation! Recommendations/Notes: Wear comfortable clothes, swimsuit, sunglasses, biodegradable sunscreen. Bring a towel, a camera and extra money for additional expenses. This tour is suitable for adults (18+) only. Put on your dancing shoes and dance the night away at Imagine Night Club! 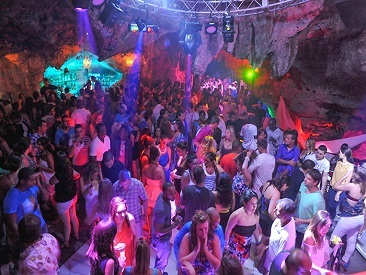 Imagine Nightclub is a popular off-resort nightlife option in Punta Cana in a spectacular location. 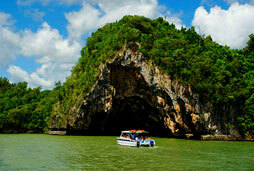 Located inside a series of caves, it’s about a 15-30 minute ride from most resorts. There are 4 different caves each with their own ambiance. Not all may be open, this depends on the number of people there to fill the space. The club regularly holds themed events, just ask our Representatives to find out what’s on during your stay. Imagine is popular with tourists and locals alike. We definitely recommend it for a wild night out.The shuttle bus is only for clients who have paid for a package with their tour operator or hotel rep. There are plenty of taxis outside Imagine that run all night long. Recommendations/Notes: Wear comfortable shoes, and bring a camera and extra money for additional expenses. This activity is for adults only (18+). Transportation generally departs from the hotel between 10:00 pm – 10:50 pm and returns between 3:30 am – 4:00 am. 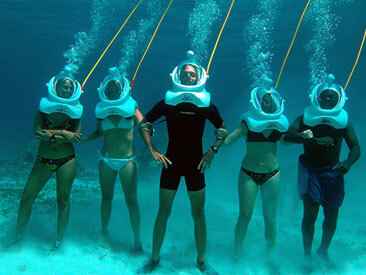 Feel the adrenaline snorkeling with sharks and stingrays. 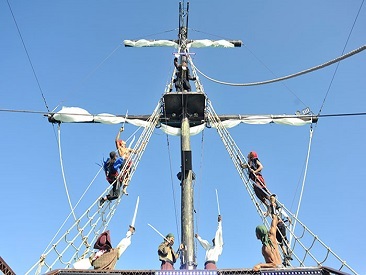 Enjoy a pirate show with professional actors and gymnasts. Get on board the largest pirate ship in the country and set sail for an adventure you will not forget. Let the pirates take you on the most epic treasure map quest, Shark Island! Jump into crystalline waters and explore the coral reef as you brace for possible attacks from rogue pirates. Sip your favorite cocktail as you enjoy the open bar and have fun watching an entertaining pirate show featuring professional acrobats. They will relive bygone times when the Caribbean Sea was practically the back patio for corsairs accosting the settlements along its shores. Get a feeling of what pirate life was like some centuries ago through this extraordinary outing surrounded by “bad guys” wielding swords while trying to keep you from finding the treasure! Included: Round-trip transportation, open bar, soft drinks, beer, rum, regional beverages, fruit. Recommendations/Notes: Wear a swimsuit, sandals or comfortable shoes, sunglasses and biodegradable sunscreen. Don't forget to bring a towel, your camera and extra money for souvenirs or additional expenses. This tour is not suitable for pregnant women. Get on board an exclusive catamaran and cruise along the coast of Bavaro where the surroundings are the perfect setting for a deliberate time off from daily worries. Gaze at fantastic panoramic views, discover white sandy beaches and immerse yourself in clear waters, living a magical experience in the natural pools surrounded by marine wildlife. All this coupled with the animation team, who will pamper you with music, drinks, Caribbean splendor and a visit to a luxurious restaurant where you will enjoy a delicious lunch with Lobster* or Steak Caprese. So, what are you waiting for? Tour Inclusions: Transportation, open bar and snacks on board, lunch at the beach restaurant. Notes/Recommendations: Wear swimsuit, sunglasses and sunscreen. Don't forget to bring your underwater camera and extra money for souvenirs. * During Lobster's off season (generally March - June, but dates may vary), Mahi Fillet will be served as main dish in place of Lobster. For guests who want to make the most out of vacation, the Power Adventure Excursion is the way to go! During this tour, participants get to go snorkeling, hookah diving, parasailing and partying on a catamaran. The sea activities show visitors the incredible marine landscape, home to colorful fish and beautiful blue waters unique to Punta Cana. After some free time snorkeling and walking on the seabed, guests are catapulted into the air for a breathtaking panoramic sights of the magnificent shore. After all that physical activity, kick back and party on the catamaran. This tour allows individuals to pick the activities that are the most fun based in personal interests. Whether guests want to take to the sea or the sky, the Power Adventure excursion has plenty to offer! Recommendations/Notes: Wear sunscreen, swimsuit and sunglasses. Bring a camera and extra money for additional expenses. This activity is not recommended for people with health problems or during pregnancy. Talcum white beaches, coconut palms, crystal clear turquoise waters and the special Dominican touch that makes for an unforgettable day of smiles - rum and merengue! Your first stop will be for a cocktail at the amazing Sand Bar in the middle of the ocean, famous for its abundance of starfish. Continue to Saona Island by speedboat for a barbeque lunch served buffet-style under the shade of palm trees right on the superb beach. What's next is up to you: swimming, volleyball, merengue or not! 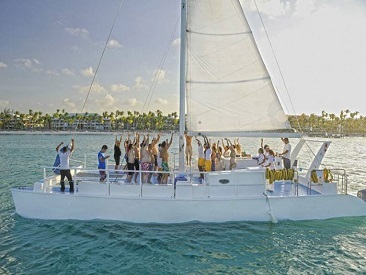 For your return, you will board an impressive catamaran for a memorable sailing voyage complete with unlimited drinks. This is undoubtedly the recipe for the best day of your vacation! Recommendations/Notes: Wear comfortable clothing, biodegradable sunscreen, sunglasses and sandals or shoes that can get wet. Bring a camera and cash for additional expenses. This tour is not suitable for pregnant women or children under 2 (due to speed boat cruise). A vegetarian lunch option is available and must be requested at time of booking. The sailing to and from the island can be speedboat/catamaran or catamaran/speedboat. Take in the highlights of the Dominican Republic's capital city of Santo Domingo on a full day city tour. Santo Domingo is the oldest city of the Americas so don’t miss your chance to take this tour and discover its rich history.Your tour begins with the discovery of "Los Tres Ojos" (three eyes caves), then leads you to visit the house built by Columbus, the Cathedral and to see the Christopher Columbus lighthouse. The colonial City of Santo Domingo is a World Heritage Site, bordered by Ozama River with buildings from the 16th century. Soak up the atmosphere of the oldest street of the new world, Calle las Damas, and experience a Dominican market where the bargains are endless and bartering is fun. A fabulous combination of the old mixed with the new. 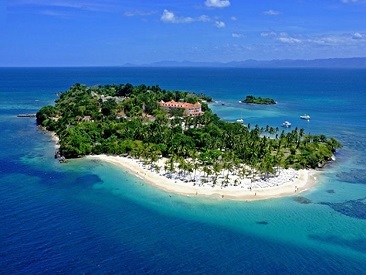 You simply must visit the Capital City of the Dominican Republic. Not Included: Tips, souvenirs and photos. Recommendations/Notes: Wear comfortable clothing (shoulders and knees must be covered for some visits--Cathedral and National Monument), sunscreen, sunglasses and sandals or sneakers. Bring a camera and cash for additional expenses. Experience an unforgettable adventure on board a spectacular catamaran and sail on the waters of Bavaro with music, a snorkel tour and a visit to the famous natural swimming pools in the region. You'll have fun like never before! Discover the wonders of the marine world swimming at one of the most beautiful coral reefs in the Caribbean Sea. In addition, you will sail off the picturesque shores of Bavaro while having fun aboard and finally, you will make a stop at a natural pool famous in the region, where you will really feel like you are in paradise! Enjoy a pleasant time traversing the waters of this wonderful place. Recommendations/Notes: Bring sunscreen, swimsuit, towel, a change of clothes, sandals and extra money for additional expenses. 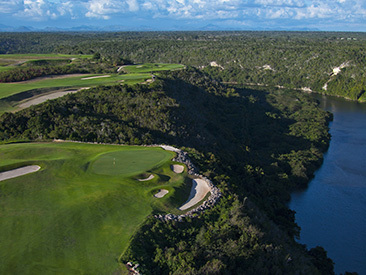 Pete Dye has taken his genius to a higher level, literally--500 feet above the Chavon River, where his course resides. 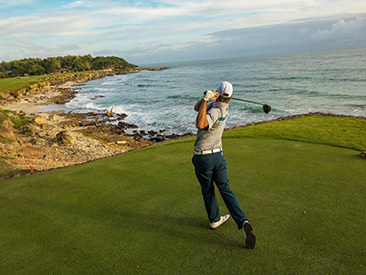 Dye Fore opened in 2003 with nine cliff side holes and sweeping views of the Chavon River and the Caribbean Sea beyond. The artists' village of Altos de Chavon and the eastern mountain range are also part of the panoramic vistas enjoyed by golfers while playing this course. An additional nine holes were added in 2011. --Includes: Green Fees, shared cart, range balls and club storage. --Not Included: Transportation, club or shoe rental, food or beverages, any other equipment not listed in the inclusions, tips. --Tee times start at 7AM. Times are subject to change by season. --Caddies are required for play on Dye Fore (rates subject to change). Minimum one caddy per group. --Tee times can be requested in advance (information will be provided on your invoice). --Minimum age for golf is 10 years old. --Special tee times or course requests outside of the package conditions can be accommodated subject to availability and subject to surcharge. --Rates are per person per round. Not available for purchase on site, must be purchased in advance. No refunds on unused portions. Subject to availability. It's an inland field gem designed by Pete Dye that evokes the Scottish golf courses with water as the beat in element in 5 of its holes. Renovated and reopened by Pete Dye in 2012. --Caddies are required for play on The Links (rates subject to change). Minimum one caddy per group. With seven holes bordering the Caribbean Sea, this world renowed course designed by Pete Dye combines beauty and challenge, earning the title of #1 ranked course in Caribbean Golf Magazine. --Caddies are required for play on Teeth of the Dog. Caddy fees: $25 per caddy for group of 1-2 players and $40 for a group of 3-4 players (rates subject to change). Minimum one caddy per group. Certified divers looking to discover shipwrecks, explore reefs and more are welcome to participate in the eight-dive package, with the option us take up to two dives per day. Visit great wreck sites like St. George or Atlantic Princess, the excellent wall dive of Catalina and reef dives both from shore and boat. Just few minutes away from La Romana lies the lush and colorful underwater paradise of Bayahibe. Explore amazing dive sites of the Dominican Republic with professional and friendly instructors . Departure Time/Location: Meet at 8:30am at the Dive Center inside Viva Wyndham Dominicus Beach. Duration: Morning double tank dive departs at 9am and returns at 1pm with a surface interval of 50-60 minutes. Confirm other dive times on arrival. Included: 2 dives per day for 4 days, professional PADI instructor or Divemaster, water on board, tanks, weights and belt, snacks. Not Included: BCD, regulators, wetsuits, mask, fins & computer rentals (available at an additional cost, payable locally). There's a supplement of $40USD for Catalina/Saona. Night dive surcharge $20USD (amounts subject to change). Recommendations/Notes: Wear swimsuit and biodegradable sunscreen, and bring snacks, towels and extra cash for additional expenses. This tour is for certified divers only. Not recommended for pregnant women. Diving within 24 hours of flying is not recommended. All participants must complete a health questionnaire. Some pre-existing medical conditions (asthma, heart conditions, etc) may prevent you from diving, please consult your doctor. Subject to favorable weather conditions. If cancelled due to poor weather, you will be given the option of an alternative date or a full refund. Not recommended for participants with heart complaints or other serious medical conditions. If you are staying at another hotel, we advise you to bring a box lunch. In case of longer than 1 year break in diving, it is strongly recommended that you start with a SCUBA Review (refresher program) before your dives (available for a fee). Dive packages are not refundable. To redeem your voucher, contact the sales rep located at the Dive Center. Learn how to SCUBA dive with a top-notch quality course with PADI professionals. Get your worldwide recognized PADI certification to dive up to 18 meters independently anywhere in the world! You can do it in just 3.5 days with friendly PADI scuba instructors. You will participate in confined sessions conducted in special pools and 4 open-water dives on fantastic dive sites in the Dominican Republic. Included: Supervision of a professional PADI certified instructor, 5 pool sessions, 5 theory sessions and 4 open water dives in the ocean, all required SCUBA equipment. Not Included: PADI open water manual and certification fee ($60USD), dive insurance (optional), hotel pickup and drop off, food and drinks. Recommendations/Notes: Wear swimsuit and biodegradable sunscreen, and bring snacks, towels and extra cash for additional expenses. Minimum age for this certification is 10 years old. Children must be accompanied by an adult. Not recommended for pregnant women or individuals with back problems, heart complications or other serious medical conditions. Diving within 24 hours of flying is not recommended. All participants must complete a health questionnaire. Some pre-existing conditions (asthma heart conditions, etc) may prevent you from diving, please consult your doctor. Dive packages are not refundable. To redeem your voucher, contact the sales rep located at the Dive Center. Coco Bongo Show & Disco is a must see it is a cross between Cirque du Soleil/Theatre/Nightclub. Everything from dance teams to trapeze artists, gymnasts and scenes from famous movies is played out to mainstream dance music. The night really is a performance, not like any other place, and you are there to be entertained and amazed. No wonder Coco Bongo Show & Disco has been praised by international media. Coco Bongo Show & Disco will create a unique experience that you'll remember forever. That's why year after year customers come back to be part of the best night of their lives. Recommendations/Notes: Cameras are not allowed (photos are available for purchase). Don't forget to bring money for tips, souvenirs or additional expenses. Participants must be 18+. Join the most popular full-day, all inclusive, mountain cultural adventure, Bayahibe Runners. Get to know the everyday lifestyle and warmth of the locals then visit a sugar cane plantation and a Trapiche (sugar mill) and know the procedure to make delicious Dominican Rum. Visit a sponsored school, take a horseback ride through the eastern mountain range until reaching colorful villages, then visit a typical home to savor fresh coffee, cacao and tropical fruits. Back at the ranch, test your courage by performing a Free Quick Jump from a height of over 40 feet (13 meters) before savoring a delicious Dominican buffet on top the Anamuya Mountain; there, witness the method used by Dominicans to make one of the greatest cigars in the world. Finish the day with a visit to Nuestra Señora de La Altagracia Cathedral, the country's biggest and most important Catholic temple. Included: Official tour guide, beverages (bottled water, soft drinks, rum and beer), lunch (rice, beans, chicken, beef, spaghetti Pomodoro, cassava and sweet potato, salads, fruit and coffee - individual items subject to change). Recommendations/Notes: Wear comfortable clothing and sunscreen. Bring your camera, sunglasses and extra money for souvenirs. This tour is not suitable for pregnant women. 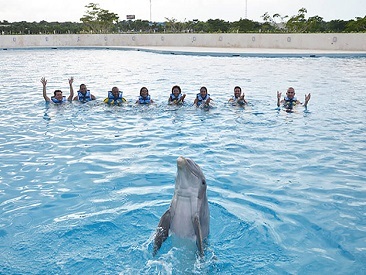 Take part on this wonderful Dolphin Swim Adventure interactive program at Punta Cana during your vacation in Bayahibe. Take a closer look at one of these loveable marine mammals; it will welcome you with an affectionate kiss and hug, and impress you with its aerial acrobatics. Dare to take an exhilarating boogie push, where the dolphin will push you across the surface of the water, while you ride a boogie board. Awesome! Get ready for the fun belly ride, where you will hold on to the dolphin's fins as it rides backwards across the water. Watch the dolphin’s neat tricks, they really are playful characters! Plus, a professional trainer will share plenty of information about these incredible marine friends and ensure that you make the most of this experience. Included: Round-trip transportation, orientation, interactive swim with one dolphin (40 min in the water), life jacket and use of lockers, dressing room and showers. Not Included: Transportation for companions not participating in the dolphin activity, towels, photos, meals and beverages, souvenirs, tips. Recommendations/Notes: Wear comfortable clothes, sandals, swimsuit, sunglasses and a hat. Bring a towel and extra money for meals, beverages, photos, souvenirs or additional expenses. Wearing jewelry and accessories that can damage the dolphins' skin are prohibited, as is the use of sunscreen or any chemical that may affect their sight (lotions, perfumes, etc). Maximum 15 participants per group. Children under 12 years old must swim with a paying adult and will perform activities according to their strength level. Pregnant women cannot participate in this activity. The use of a life jacket is mandatory for all interactive programs. Explore the underwater world with this incredible adventure. Snuba allows you to experience scuba diving with the ease of snorkeling, with no difficult license courses since it is available for anyone wanting to be amazed by the wonderous underwater sights without the encumbrance of scuba diving gear. The qualified, bilingual staff is ready to assist you at all times, so you can be sure your tour goes as smoothly and fun as can be. Besides the catamaran, feel the adrenaline flowing while zooming over the waves on a speedboat all of your own. You can also relax on the underwater chairs and experience the beautiful submarine life in a more subtle way. See Punta Cana’s astounding reef, one which teems with fabulous varieties of fish and features interesting light reflections on its rugged surface. Recommendations/Notes: Wear beach clothing, swimsuit, sunglasses and a hat. Bring biodegradable sunscreen, towel, waterproof camera and cash for souvenirs, tips or additional expenses. This tour is for children 8 years old and older. The minimum age to drive boats is 18 years old. Recommendations/Notes: Wear beach clothing, swimsuit, sunglasses and a hat. Bring biodegradable sunscreen, towel, waterproof camera and cash for souvenirs, tips or additional expenses. The minimum age to drive boats is 18 years old. Recommendations/Notes: Wear a swimsuit, comfortable clothing and shoes (no flip flops), sunglasses, hat or cap (preferably with straps). Bring towel, biodogradable sunscreen, camera and cash for souvenirs, tips, beverages or additional expenses. Drivers must be at least 18 years old and have a valid driver's license. Minimum age for buggy passengers is 8 years old. Not recommended for people in wheelchairs or those who have difficulties walking. Pregnant women and guests under the influence of alcohol are not allowed on the tour. Two people must book this option for double riders.